Villa Joseph Marie High School students have plenty enough energy left after their 10-hour dance-a-thon Friday, Dec. 9 to celebrate raising more than $89,000 to help children with cancer. Compassion, commitment and business savvy made for a successful Friday night, Dec. 9, at Villa Joseph Marie High School in Newtown, where for the fifth year in a row 99 percent of the 380 students danced for 10 hours to help children being treated for cancer at Penn State University’s Children’s Hospital. 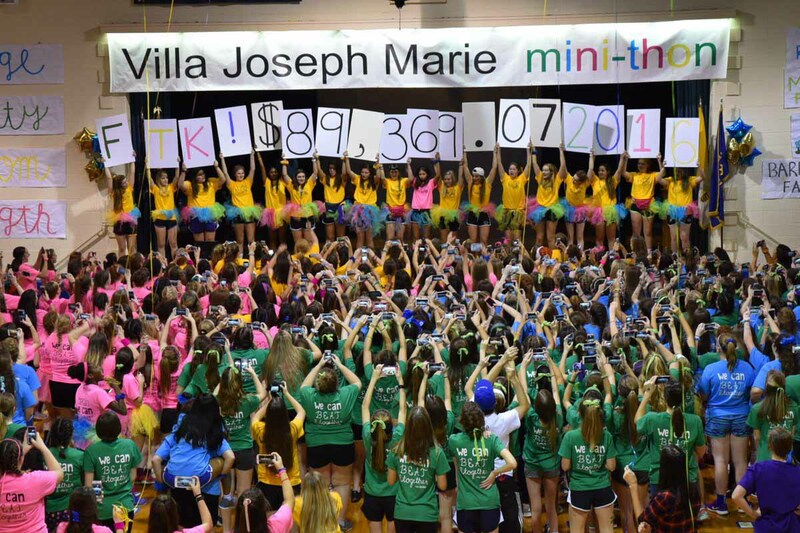 Villa Joseph Marie’s mini dance-a-thon raised $89,000 for the Four Diamonds Mission, which works to conquer childhood cancer, and towered above the $12,000 raised at last year’s event. The students broke their own record and even after 10 hours on their feet were re-energized enough to start laying the groundwork for next year’s event. Sophomore Camila Drobac said she’s hoping that, over the next two years, she and her fellow students can work harder to “see where we can take this,” she said. Drobac already knows what that commitment means because this year she served on the event’s finance committee. That includes wearing down shoe leather by visiting various businesses to ask for donations, sending emails, making telephone calls and even taking time from casual visits to various communities to tap merchants for money. The kids hit the ground running last spring and stayed in motion until the big event. Many donations came in from VJM alumni, local food stores and other benefactors, Drobac said. “All our teachers helped and it was something to see this, to watch this grow, and to understand how the money we raise works for children,” she said. 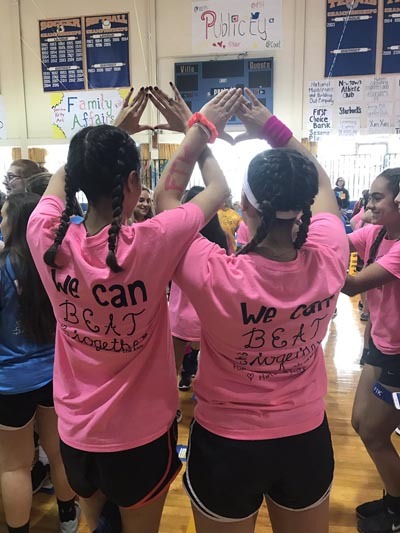 Students of Villa Joseph Marie High School in Newtown dance the night away — for 10 hours — Dec. 9 at the school to raise money in the fight against childhood cancer. The students started dancing at 1 p.m. and kept going through to 11 p.m. They stopped for lunch and dinner, and during breaks, listened to various speakers, including classmates who had been cured of cancer, some who were still in treatment and little children stricken with the disease. Other guests talked about the technological advances that are helping to cure more types of cancer, and they reassured the dancers that the money they raise goes toward effective weapons in the battle for a cure. Faculty members, students’ families and friends were allowed on the dance floor from 8-10 p.m., for a $5 donation. The students left no avenue unexplored when finding ways to rake in cash for the cause, Drobac said. For Kaela Jolibois, a junior, the stories told by former and current cancer patients opened her eyes to their suffering and their spirit. “What kept me going was hearing the stories of what they went through. You’re dancing and your legs hurt and you feel uncomfortable. You hear about what they went through and it gives you more energy. It makes you think about your own great childhood, and that you didn’t have to deal with that. It makes you want to do more for others,” Jolibois said. The question might still remain: How do you hold out listening and moving to a constant mix of hip hop, country and pop music? Senior Navya Kotha has the answer: Support from faculty and families, the spirit of the night and the goal of helping others. “This is about the entire school coming together to make money. It’s for the kids. It’s a long day but the breaks, the water stations and even the teachers’ performances make the hours count down and the time go by,” said Jolibois, who plans to attend college to study business information. By Monday, school Principal Lauren Carr said that spirits were still high over the success of the mini dance-a-thon. It has evolved over the years into a philanthropy by the student body, who handle every aspect of the event on their own. VJM, Neshaminy and Pennsbury high schools, all in Bucks County, attend each others’ events and share ideas. And VJM students remain conscious of the results of the dance-a-thon by keeping it, cancer victims and their families in daily prayer. “From September through June, at least one student in every class will mention the dance-a-thon or a family member, or one of the ‘angels’ who have passed in their prayers,” the principal said. Have had childhood and youth cancers in the family. A cure is needed NOW! !